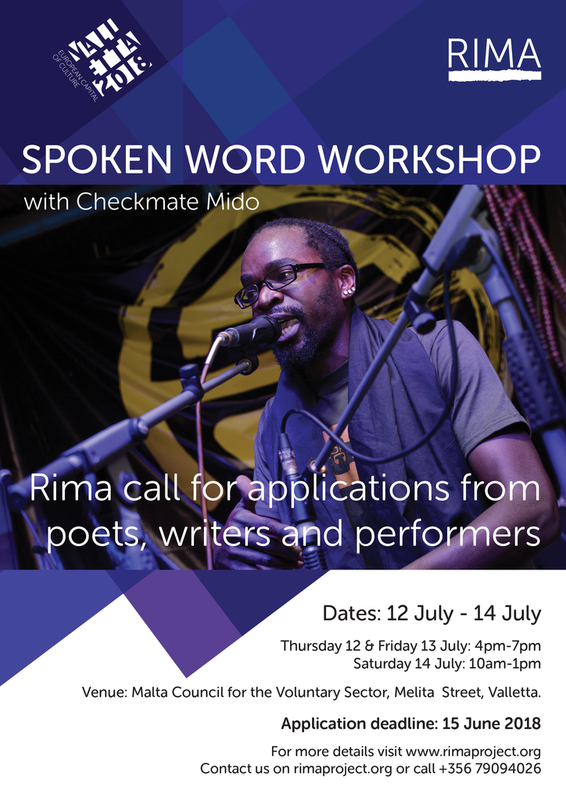 If you live in Malta, and have an interest in spoken word, whether you are an amateur, storyteller, poet or musician, don’t miss the next Rima Spoken Word Workshop. This workshop will be led by Checkmate Mido (the dancing poet), a poet, musician and beatboxer. We encourage individuals who have experienced some form of exile and migration to apply. The number of participants is limited to 10. If you would like to participate in this workshop, please fill in this form to provisionally reserve a place, or contact [email protected]. well) which he then collects and creatively weaves together through collaboration and music. He has co-facilitated a poetry performance workshop in Nairobi with Bassey Ikpi (Def Jam Poetry Star) in 2015 and opened up for global poet/hiphop artist Akua Naru during her 2016 African Tour. His poems and songs have been featured on BBC (Focus on Africa and Arts Hour), Badilisha Poetry and SPOKEN WOR:L:DS (see link https://spokenworlds.bandcamp.com/album/spoken-wor-l-ds-nairobi-berlin). He is the founder and one third of the band ‘box Of beats’ with which he recorded and released the well received ‘Box of Beats EP’ in 2016. He is currently in studio working towards an album scheduled for release in November 2018.